Born of cold and winter air and mountain rain combining, the man called Scott is an ancient sorcerer from a long-forgotten realm. He’s more machine now than man, twisted and evil. Or, you know, he could just be some guy who loves video games, animations and cinema who just wanted to write about such things. 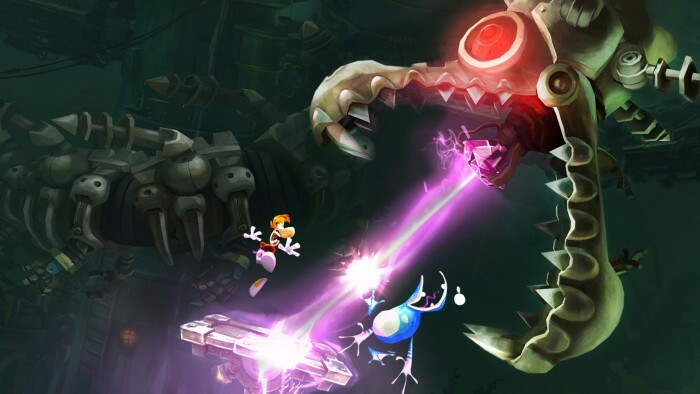 As a follow-up to Rayman Origins, Rayman Legends retains much of the side scrolling mayhem of its predecessor, while ironing out some of Origins’ shortcomings. First and foremost, level progression has been streamlined so players can go at their own pace. Each of the game’s world’s and stages are accessed by jumping into paintings in a central hub. 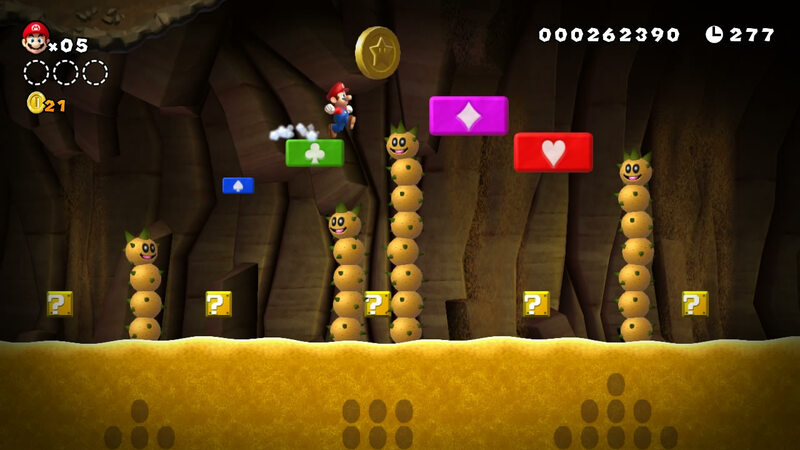 You’ll still need to collect Lums (think Mario’s coins) and rescue creatures called Teensies in order to unlock more stages, but often multiple stages are unlocked all at once, leaving players to decide where they should go next. The difficulty has been better balanced from Origins. There are still plenty of difficult moments, but its less demanding, and less punishing than its predecessor. Some platforming veterans may cry foul at the game’s more accessible approach, but its more stable difficulty curve makes for a more enjoyable, less frustrating game. Characters such as Rayman, Globox and Teensies are playable, just as in Origins. They are now joined by a cute barbarian girl named Barbara. Various other characters can be unlocked throughout Legends, though they are mainly just reskins. 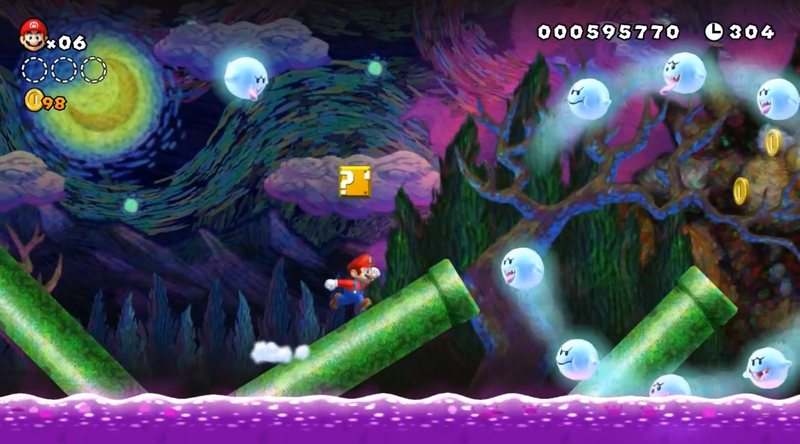 The Wii U version even includes versions of Rayman and Globox decked out as Mario and Luigi. Legends benefits for being just as much fun to play alone or with friends. The recent craze of four-player sidescrollers finds a good balance here. It never feels empty when playing alone nor does it feel overcrowded with four. The gameplay remains unchanged from Origins. Rayman and friends have all the moves they learned in the 2011 title, and have no room to learn any new tricks here. Whether or not this absence of new mechanics is a means to make the game more accessible or just a cop out for a lack of ideas is up for debate. Thankfully, the level design makes up for any other creative missteps. The stages here are a chaotic frenzy of platforming. There’s rarely a moment that doesn’t keep players on their toes. There’s always something to be jumped over, bounced on, or slapped into oblivion. The best are the music stages, which require you to progress through the level in sync to the background music. The music selections include such crazy mashups as a salsa version of Eye of the Tiger and the theme music from Kill Bill sung in a giggle-inducing gibberish. Sadly, the music stages are few, and not all of them feature such creative twists on licensed music. 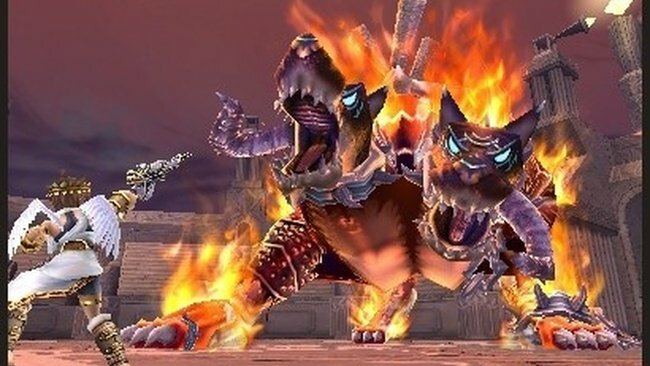 The Wii U version features stages built around the wii U Gamepad, in which players take control of a creature called Murphy. Murphy doesn’t take part in the platforming, but works as a sort of cursor through the Gamepad’s touchscreen. 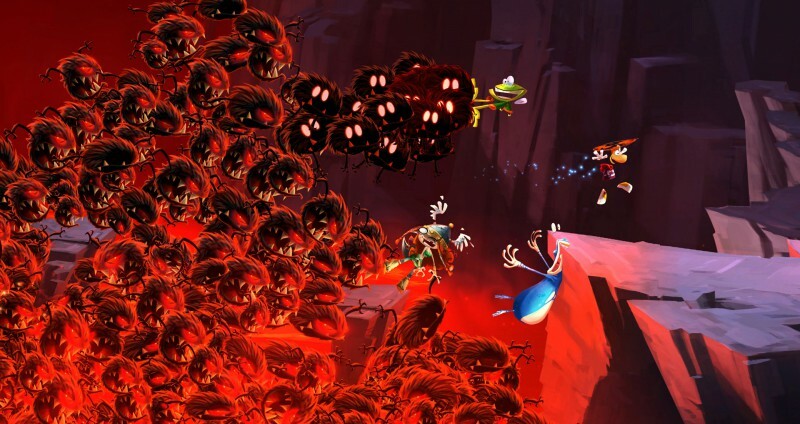 Murphy can interact with the environment in ways to help out Rayman and hinder enemies. He can even double the points awarded for Lums. The Murphy stages are a bit of a bittersweet deal, however. They are creative, and make good use of the Gamepad. But they are intended for a multiplayer crowd. These stages are vastly more fun with one player controlling Murphy and the others controlling Rayman and company. If played by oneself, the player must take turns playing as the platforming character and as Murphy, which not only makes for awkward breaks in gameplay, but also leaves a less-than-reliable AI in control of the platforming character when the player takes control of Murphy. The visuals are a bright, cartoonish treat. The hand-drawn visuals of Origins return, with added flairs in lighting and shading. The music is equally as delightful and silly. Rayman Legends may feel like more of an extension of Origins than a full-on sequel (it even includes most of Origins’ best stages), but its a darned entertaining game filled with style and charm. It’s not the most creative platformer out there, but its so fun you might not even care. 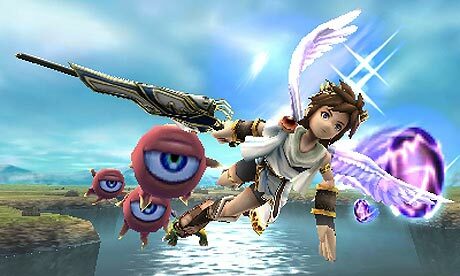 Kid Icarus Uprising sought to resurrect Nintendo’s long-dormant Kid Icarus franchise (last seen on the Game Boy twenty-one years prior) and turn it into a modernized action game. For the most part, Uprising succeeds in its mission. Taking cues from the likes of star Fox 64 and God of War, Uprising’s stages alter between hectic on-rails shooter and grounded beat-em-up. Both segments use the same style of control, Pit’s movements are controlled with the thumbstick, the touch screen is used for aiming,and the L trigger performs attacks. It’s a simple setup that’s easy to learn, and works in surprisingly versatile ways. Though the setup works best in the flying segments, because when Pit is on land, the touch screen is also used to control the camera. As one might guess, using a touch screen to move a camera and target enemies can feel muddled, which takes away some of the smoothness from the experience. The story is typical Nintendo: The forces of the underworld are causing mayhem and chaos, and the goddess Palutena sends her warrior angel Pit to put a stop to it. It’s a simple plot, but one that comes alive due to the colorful personalities of the characters, and a good dose of fourth-wall breaking humor. It does introduce the trope of a black-clad “dark” version of its main character, but at the least, the game and character in question are aware of the trope. What might have otherwise been a series of anime cliches is made into an amusing parade of charm and character. There are also few cinema tics, with the characters instead giving their say-so about nearly every situation Pit finds himself in. It can get a little too chatty at times, but for the most part it’s entertaining banter. A sleek visual look make the game one of the most eye-catching in the 3DS library. The character models are detailed, and the world’s colorful. It’s 3D effects are limited, but turn the 3D off and you’ll soon find you want it back on. The musical score is surprisingly versatile, taking cues from Super Smash Bros., Uprising’s score is suitably epic and oftentimes gives the game an heir more akin to a console title. 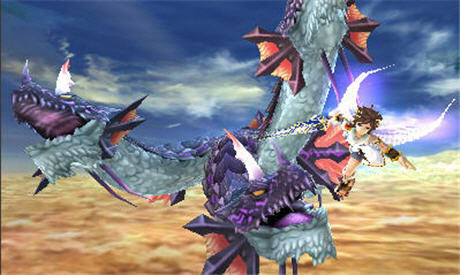 Multiplayer modes come in two varieties: Free-for-alls see players battle each other down to the last man standing, while Light Versus Dark mode sees two teams of three face one another, once the team members of a team are damaged enough, one of their comrades will become one of the angel characters (Pit for light, Dark Pit for dark). Victory is attained by defeating your opposing team’s angel. These multiplayer modes are fun additions to what is already a hefty adventure, and playing both modes unlocks more weapons and items that can be used in single and multiplayer, giving you plenty of reasons for return visits. There are many unlockables, trophies and challenges to be found. Long after you’ve finished the main adventure, Uprising makes sure you have plenty more to do. You’d probably want to replay it all anyway, as the story mode is a much larger scale adventure than you would expect from a handheld title. And the multiplayer modes – while sometimes a little too chaotic for their own good – are fun little deviations. It’s not only a great 3DS game, it also brought a relevance to an abandoned Nintendo franchise that it never quite had before. In 2006, Nintendo released New Super Mario Bros. for the Nintendo DS. At the time, it had been fourteen years since Mario and Luigi starred in the genre that made them famous. New Super Mario Bros. brought back the side scrolling, hop-and-bop platforming from Nintendo’s heyday, and established the formula for a new generation. The “new” in the title meant something. New Super Mario Bros. 2 doesn’t share the advantage of old-made-new that its predecessor did. It’s a tried and true platformer, with the same tight controls and technical polish that Mario is known for. But it lacks the series’ trademark sense of imagination. There is little to be found here that couldn’t be found in New Super Mario Bros. on the DS or Wii. Even the music is largely comprised of recycled or remixed tunes from the DS original. That’s not to say that New Super Mario Bros. 2 is completely void of ideas. This entry’s big draw is its focus on coin collecting. Gold coins are all over the Mushroom Kingdom (more so than usual), and the Mario Bros. are determined to rack up a million of them, with the coins you collect in any given stage being added to your grand total upon completion. 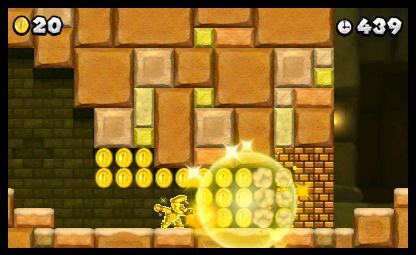 The game has a lot of fun with how it goes about this gold frenzy: Jumping through gold rings causes Mario’s enemies to leave trails of coins wherever they go, and a new spin on the classic Fire Flower turns Mario gold (and Luigi silver, naturally), allowing you to shoot gold fireballs and turn everything they hit into more coins. Rescuing Princess Peach becomes an afterthought in the midst of this Scrooge McDuck level of penny-pinching. The coins are a fun diversion, but one that doesn’t add any real depth to the experience. Game overs are never a worry, as the game stays true to the series’ tradition of one-hundred coins granting an extra life. With the sheer abundance of coins littered everywhere, you’ll find that your extra lives skyrocket to the point that you’ll never have to worry about seeing a game over screen, and the level design is hardly difficult enough to justify such generosity. It’s one of the easiest Mario sidescollers, made easier through its own gimmick. Despite these drawbacks, New Super Mario Bros. 2 is a fun game. True to the nature of the series, it controls like a dream, the gameplay is as fluid as ever, the 3D gives the game a nice visual pop, and it strikes a few joyous nostalgic moments (the raccoon tail from Mario 3 returns, as does recurring boss Reznor from Mario World). But for all the things it does right on a technical level, it lacks just as much in terms of substance and creativity. Sequels have rarely slowed the imagination of the Mushroom Kingdom, but New Super Mario Bros. 2 often feels rehashed, relying on gimmicks to add a superficial sense of identity to the mix. New Super Mario Bros. 2 is a fun, solid platformer, but that “New” in the title is a little on the undeserved side this time around. New Super Luigi U is a strange take on the New Super Mario Bros. series. It was released both as DLC for New Super Mario Bros. U and as a standalone title. The gimmick is that it’s all built around Luigi. The under appreciated green Mario brother finally gets a sidescroller to call his own. Though it does feel more complimentary to NSMBU than it does a full-on adventure, it still provides solid platforming. New Super Luigi U uses the same exact world map as New Super Mario Bros. U, but the 70+ levels within it are entirely new. The time limit is cut short to a mere 100 seconds, meaning that infamous ‘hurry up’ jingle will be heard as soon as you begin a stage. It makes for a more hectic affair than Mario’s usual ventures, and is sure to please those looking for a challenge, but it is perhaps an unnecessary change, since the courses here are already considerably more difficult than those found in Mario Bros. U. The shortened time limit is also reflected by the fact that these courses are smaller, leaving them to feel more like quick-fire challenges than the more complete platforming locales the more famous Mario brother is known for. To make things more difficult (and to give this game a little more distinction), Luigi now boasts his floatier jumps from Super Mario Bros. 2. Officially dubbed “Luigi physics” by Nintendo, Luigi’s gravity-defying abilities mean the green-clad plumber spends more time in the air, which might prove troublesome in the courses where you need to be as quick as possible. Luigi’s movements on the ground are also more slippery when compared to Mario’s, which can also lead to some accidental losses. New Super Luigi U is definitely catered to seasoned plat former veterans. But for novices who still want to join in on the fun, there is a silver-lining. Nabbit, the rabbit-like thief from New Super Mario Bros. U is now a playable character in multiplayer, and is impervious to enemy attacks. It may seem like a cheat, but Nabbit is also unable to grab power-ups, and can still be killed by falling into pits. Nabbit serves as a means for beginners to learn the ropes alongside more experienced players. New Super Luigi U may not have the weight to entirely justify a standalone purchase, but if viewed as a kind of super hard mode for New Super Mario Bros. U, it makes for a great piece of DLC. It’s higher difficulty and shorter stages may not be everyone’s cup of tea, but it will be something of a treat for those seeking a platforming challenge. New Super Mario Bros. U is as its name implies, a New Super Mario Bros. game on the Wii U. But don’t let the uninspired name and cliched aesthetics fool you, this is the heftiest entry in the “New” Super Mario sub-series by she margin. It may not reach the creative heights of classics like Super Mario Bros. 3 or Super Mario World, but it is an improvement over its predecessors. The gameplay remains largely the same. 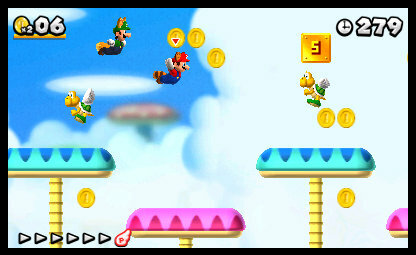 Up to four players can join in a side scrolling romp as either Mario, Luigi, or two different colored Toads (all of which play identically). This time around, an added fifth player can use the Wii U Gamepad to help (or hinder) the other players by creating platforms using the touchscreen. It’s not a radical use of the Wii U Gamepad, but it does add a little ‘newness’ to this tried and true formula. NSMBU’s primary new power-up is the flying squirrel suit, which allows Mario and company to glide through the air and latch onto walls. It won’t be remembered as one of the great Mario power-ups, but it brings some fun to the table, and compliments the returning Fire Flowers, Ice Flowers and Power Stars of yesteryear. The level design deserves the most praise. While New Super Mario Bros. on the Wii and 3DS may have felt like they were simply going through the motions, New Super Mario Bros. U brings a genuine sense of creativity back to the level design. Finding every last Star Coin becomes a challenge, and some of the later stages will test even hardened platforming veterans. 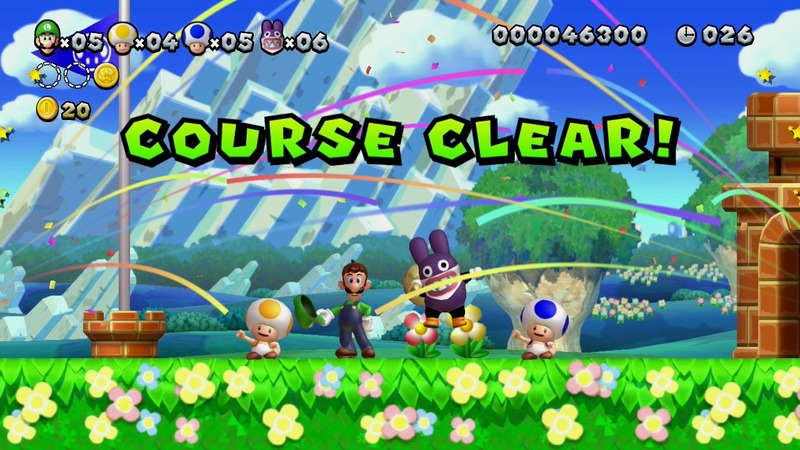 Additionally, a character called Nabbit will occasionally appear in a previously completed course, which transforms the stage into a hectic chase sequence. Catching Nabbit will award players with an enhanced version of one of the game’s power-ups. While the game mostly plays up familiar Mario elements, there are some new modes added to New Super Mario Bros. U. Challenge mode and boost rush add a little deviation from the usual princess rescuing, while adding some extra difficulty to the mix, while also giving you the chance to play as your Miis if you so desire. New Super Mario Bros. U was the first time the Mario series had been presented in HD. Although the visual design of the game plays things safe -lacking the robust visual splendor of Galaxy- the added HD gloss does make the game more eye-popping than its predecessors. Unfortunately, the music is mainly recycled from New Super Mario Bros. Wii. It’s nice and catchy, but far from the most memorable in the series. New Super Mario Bros. U may not entirely justify that “New” in the title, but it is nonetheless an entertaining and meaty platformer that outdoes the other entries in the series. If anything, it’s proof that even when Mario isn’t at his A game, he’s still outperforming his rivals when it comes to pure fun. Mario Kart 8 is essential for any Wii U library, and possibly the most fine-tuned entry in the beloved series. The HD visuals combined with the colorful Mario aesthetics make it an absolutely gorgeous game, but the real highlight isn’t in the visual department. 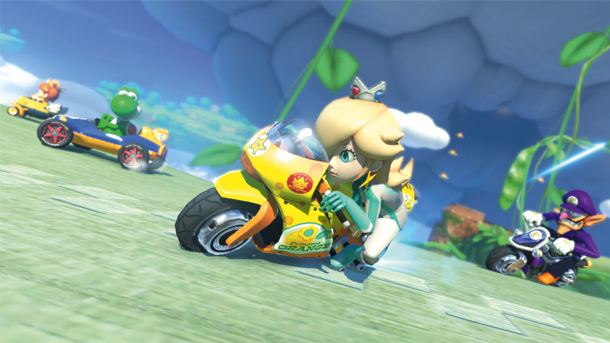 What makes Mario Kart 8 work so well is its overall structure. 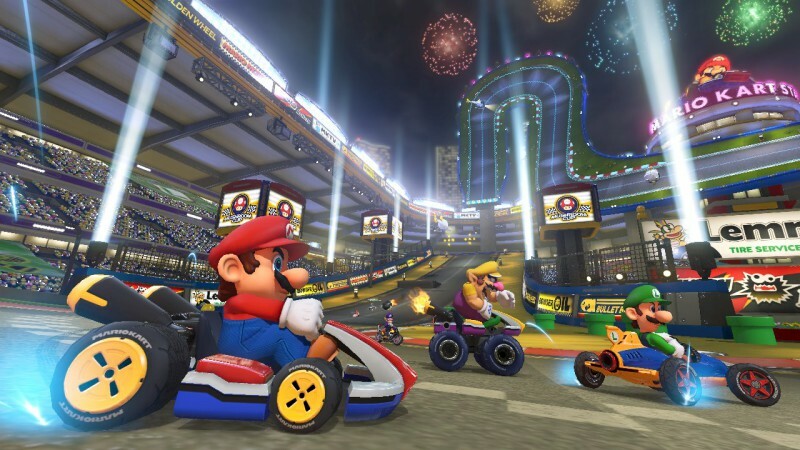 Weapons like Koopa Shells and Lightning Bolts return, it wouldn’t be Mario Kart without them. But while most entries seem to favor the racer who was lucky enough to nab the best items, Mario Kart 8 balances the items and instead emphasizes player skill and understanding the track designs. 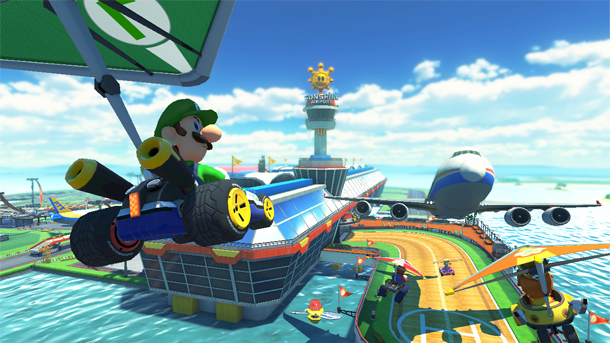 Drifting and stunts give players a small boost, as they have in past Mario Karts, but here you’ll find the tracks are largely built around them. Ramps and curves are liberally spread out across the tracks, leaving the player to learn every last one of them. Missing even a single drift boost can impact where the player scores when they cross the finish line. That doesn’t mean the game is overly demanding. This is still Mario Kart, after all. While it may take some mastering to be able to whiz through the tracks, the aforementioned items – no longer taking center stage – are now used to smooth things out. New items include the Boomerang – which can be used up to three times, with each throw having two chances to take out opponents – and the Piranha Plant, which chomps nearby racers, giving you a boost in the process. Then there’s the Super Horn, which sends a shockwave that not only takes out other racers, but incoming projectiles as well. That includes the infamous Spiked Shell. These new items join most of the series mainstays, and help bridge the gap between player abilities, making races feel more unpredictable than they might otherwise be. Though Nintendo might have gone a tad overboard when trying to balance the frequency of these items, as Mushrooms seem annoyingly common, which may get frustrating given the limited effectiveness of their boosts. It’s not just that the mechanics have been refined that make Mario Kart 8 such a blast, the track designs themselves are among the best in the series, and greatly benefit from anti-gravity sections, which allow for some creative twists to what is to be expected from Mario Kart tracks. Turning the courses upside down and driving against walls brings to mind Super Mario Galaxy or the bonus stages from Sonic the Hedgehog 2, and it brings a sense of freshness to the Mario Kart series. Retro tracks return, with slight modifications to take advantage of the anti-gravity segments. They’re all the better for it. One track sees you driving against waterfalls, grabbing small boots so you don’t fall behind in its current, while another seems to be Nintendo’s recreation of Sugar Rush from Wreck-It Ralph. The tracks boast some of the most fun designs in the series (not to mention a diversity of stunning visuals between them), and it lacks that gimmicky stage or two that seemed thrown in to some of the past few entries. If only the character roster could share in that creativity. While the obvious favorites like Mario, Luigi, Yoshi and Peach return, many of the newcomers feel like bottom of the barrel selections. The Koopalings are a welcome addition (even if they do take up a good chunk of the roster), but too many alternate versions of existing characters (namely baby versions of the Mario Bros. and Princesses) feel tacked on. And Pink Gold Peach may just be the low point in Nintendo character ideas. It’s true, the play styles of the characters and karts are what’s important, but given this is a series with no shortage of heritage to draw from, the inconsistent roster feels muddled. But the vehicle diversity – which includes the return of Mario Kart Wii’s bikes – largely make up for the wonky characters. You’ll find that each vehicle adds its own tweaks to the gameplay, which makes for a more varied experience. The online features will probably have you returning more than anything. Mario Kart 8 will have you testing your abilities in races or tournaments with players from around the world, meaning you’ll always have someone to play with, and it all works so smoothly that you wish Nintendo’s other franchises could offer such an online experience. You can even choose your own settings (limiting items or no items at all, for example), and hosting tournaments creates its own Miiverse community, making communication between players all the easier. Best of all, you can now take the replays of your races, and post their highlights in a video directly to YouTube via Miiverse. You don’t exactly get a lot of editing tools, but the option to upload videos directly from the game is a treat, and another feature I hope makes return appearances in Nintendo titles. Mario Kart 8’s one great drawback is the Balloon Battle mode. Since the series inception, Balloon Battles have been one of Mario Kart’s greatest highlights. But here it’s all watered down. Gone are the battle arenas, now Balloon Battles are held in one of the standard race tracks, with the anti-gravity sections omitted of all things. You still must deplete your opponents’ balloons with the use of items, but the experience has been sullied of the very aspects that made it one of the most memorable experiences in the series. It’s a bit baffling that Mario Kart 8 gets so much right, and yet it’s the battle mode of all things that is left out of its vision. When considering the overall package, it’s a small detraction. 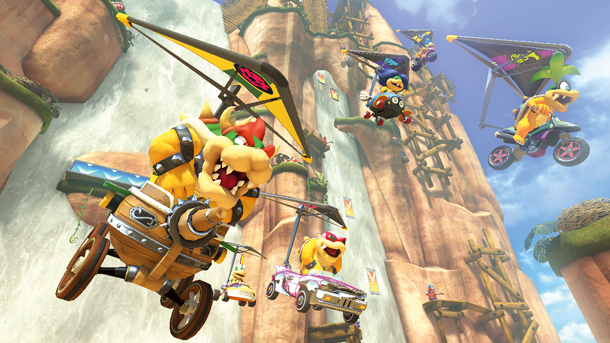 Mario Kart 8 is as fun and addictive as any party game Nintendo has made. The control options are a plenty, whether you prefer traditional methods or motion controls, Mario Kart 8 has them all fine-tuned. And the presentation, from the eye-popping HD visuals to the beautifully orchestrated score, Mario Kart 8 delivers in spades. It has its missteps, but they are forgivable when you consider this is likely the finest of all Mario Karts. And doesn’t that say it all?